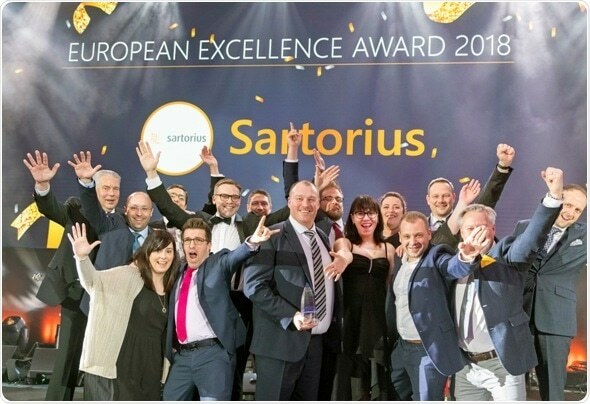 Sartorius, a leading international partner of biopharmaceutical research and the industry, was once again a double award winner at the Fisher Scientific European Sales Conference in Karpacz, Poland, retaining the same awards won in 2018, European Excellence and Supplier Best Booth. The European Excellence Award recognized the cooperation between Fisher Scientific and Sartorius. The award was presented by Anke Schimko, Vice President Portfolio Management, at Fisher Scientific. This supplier has constantly performed at a high level, working with our Sales and Portfolio Management teams to embrace all the elements of our new Supplier Tiering Programme and ensured they immediately achieved Tier 1 Status. In addition to the European Excellence Award, Sartorius also won Supplier Best Booth award once again. This award is voted by the Fisher Scientific Commercial team and recognized the supplier whose booth best incorporates the four values of Fisher Scientific: involvement, intensity, innovation and integrity.